The Money Tree (Pachira aquatica) is a plant that has many legends and beliefs originating from China. Although there are many tales and stories as to its beginnings, the most common story is that a truck driver in Taiwan had decided to braid the trunks of five small trees in a single pot. A more legendary tale floats around of a very poor farmer who was very down on his luck and spirit. One day, he found a very curious looking plant with braided trunks. Upon inspecting the plant, he found the plant to be very hardy and resilient, and took this as a lesson that he as well should learn to be resilient and strong. From the seed of this miraculous plant, he grew more of them and sold them. Today, money tree plants are very commonly found in homes and offices because of their ability to survive with minimal care. The money tree plant is also highly idolized by those who practice feng shui because they commonly sprout five leaves on a stem. Five is an important number in feng shui because it is believed that everything within the universe is made up of five distinct elements: water, wood, fire, earth and metal. It is believed that if you place a money tree plant in an area that is exposed to areas concerning money, the money tree plant will bring the owner good luck and fortune. 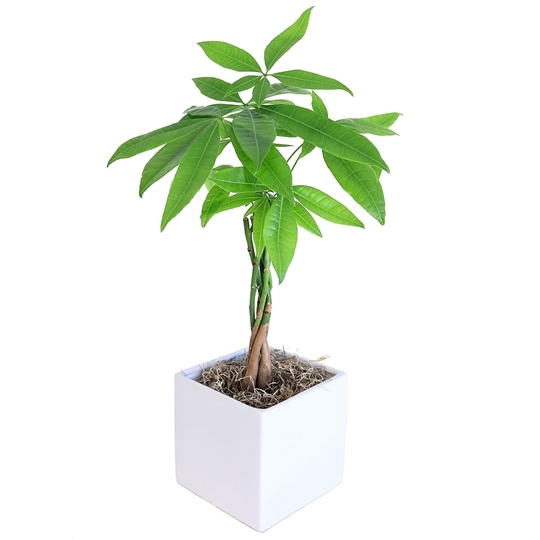 Often adorned with red ribbons and symbols, the money tree plant is perfect as an office/business gift because of its ability to grow in low light, minimal watering and care, and the wealth and good fortune it brings. Care information on the money tree plant can be found here.